IMHA Advocates are specially trained to work within the framework of the Mental Health Act. Mind in Croydon deliver this service as part of Advocacy for Croydon, providing an IMHA service to qualifying patients residing in and funded by Croydon. This includes Croydon admission wards at Bethlem Royal Hospital and Croydon residents at PICU. Anyone who is being treated in hospital or in the community under a section of the Mental Health Act (and some other people) have a right to an IMHA Advocate. An IMHA Advocate can continue to work with you even if you are no longer on a section and you are an informal patient. As the Advocate’s work is instructed by the individual, consent from that individual is required when making a referral on their behalf. We aim to promote the interests and rights of anyone residing in and receiving support through Croydon who may be suffering from mental health problems. Sometimes people find it difficult to express concerns about their treatment or care while they are in hospital or living in the community. It can be particularly difficult if you are on a ‘section’ or if this is your first time in hospital. However, you have the right to be heard; your opinions should be listened to by the professional staff. An advocate can help you either by supporting you when you wish to voice your concerns or by representing your concerns if you feel you are unable to do so. The Advocacy Service operates independently of the mental health services. You will be listened to and treated with respect. Listening to you and helping you have your voice heard. Empowering you to speak for yourself. Providing clear information about rights, medication and any aspect of treatment while in hospital. Supporting you in gaining legal advice and representation if necessary. Signposting you to other services who can provide support to meet your needs. As the Advocates work as instructed by the individual, consent from that individual is required when making a referral on their behalf. Alternatively, you can complete a referral form by clicking here. 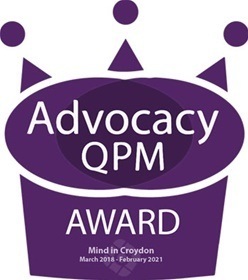 Mind in Croydon has been awarded the Advocacy Quality Performance Mark (QPM) from the National Development Team for Inclusion (NDTi). The QPM is the UK’s only independent quality performance mark for organisations offering independent advocacy.